I decided to finally smoke this busted stogie for a contest being run over on r/cigars challenging people to smoke their cigars that suffered tragic destruction and were just lurking in our humidors. Glad I did! The original Millenium line began in 1999 and was only available as a perfecto. 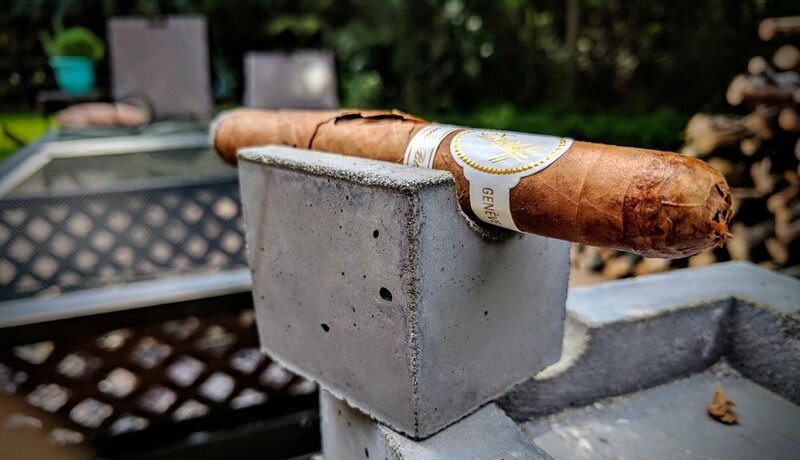 A couple years later, Davidoff released four more vitolas – petit corona, churchill, robusto and lonsdale, the subject of this review. Since then the blend has been slightly tweaked and multiple additional vitolas have been developed as the Millenium line gained popularity. The Millennium blend is billed as Davidoff’s most ‘full-flavored’ blend and has an uncharacteristically dark wrapper – at least for a Davidoff White Label stick. Davidoff initially developed this line to commemorate the millennium. Luckily Y2K had no effect. I feel like Kelner messes with the blends in these vitolas a lot more than than a typical line. Almost everything I read, each vitola has a modified blend. These are regarded as some of the best Davidoffs around. Davidoff’s website no longer lists the lonsdale vitola. I’m not sure if it’s been discontinued or they just elected not to represent it on the site. Davidoff has seemingly perfected their band to represent their line. It’s classy and timeless. They always maintain the oval shape, usually white until recent years, with embossed gold dots encircling it. Their use of the secondary band really suits the brand well, allowing for an instantly recognizable primary band and an informative secondary band. No complaints here with the simple approach to the band design. Outside of the massive crack just below the secondary band, the lonsdale looks fantastic. 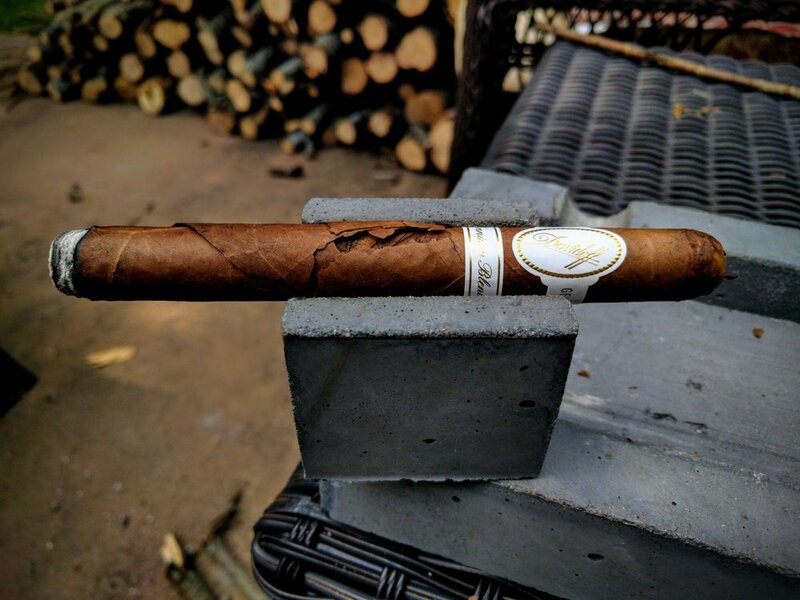 Like most Davidoff stuff, the construction is never an issue. The body has no soft spots. The cap is barely distinguishable from the body and the foot looks well packed and rolled. The wrapper is a gorgeous saddle leather red-brown and is uniformly smooth, with only a few slightly raised veins. 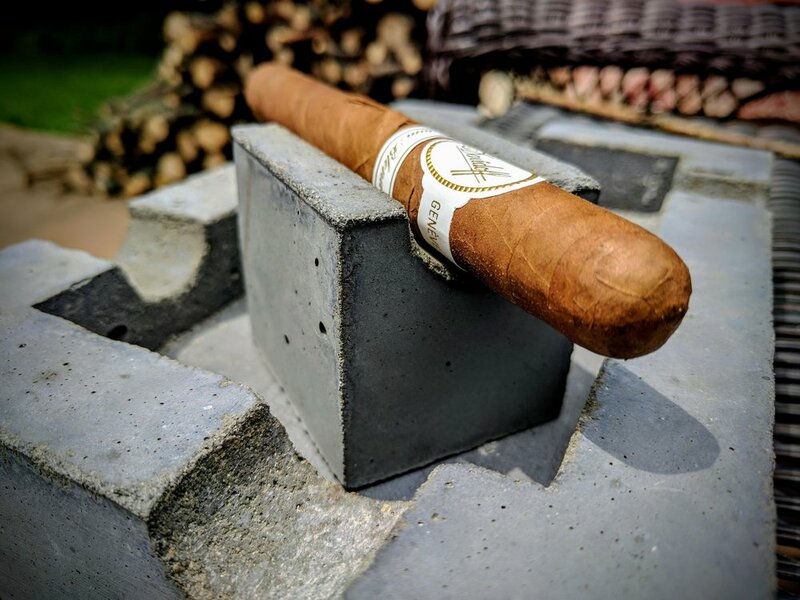 I was careful when examining the cigar as to not make the cracks worse throughout the body – I’ve been holding on to this one for a while and am glad to have a good opportunity to smoke it. The body is solid, with no soft spots. The vitola feels good in the hand as well. The foot reveals aromas of chocolate, cedar and leather along with some vintage tobacco, which I guess shouldn’t be a huge surprise. The cold draw offers up some sweet cedar and maybe a little cinnamon. I usually straight-cut all my cigars but I was a little concerned to do so given the delicate nature of the wrapper. This time I elected to use my Perfect Draw that I was gifted a few weeks back. In hindsight, it was a bad idea – as the tool moved through the body, the wrapper flexed and broke apart a little more. Oh well – lesson learned! The cigar still lit up nicely – I used my new ST Dupont. The immediate flavor to leap forward is a nice sweet, cool cocoa. Lost some ash only about a half inch in. Draw might be a little tight but not terrible – I am tempted to straight-cut it a little bit more. There’s remarkably little smoke coming out of the cigar. When puffing it’s barely satisfactory and when resting it looks completely out. So far, the wrapper seems to be holding up well. It’s slowly burning as the ash progresses down the body of the cigar. Surprisingly, no major issues so far. The flavors are really phenomenal – shockingly sweet and definitely a healthy dose of chocolate. The more I smoke, the more I am thinking it’s more of a lighter white chocolate, instead of milk or dark chocolate. Again, the draw is getting a little tough – time for a cut. The cut really opened the draw up, smoke production improved vastly. The sweetness and chocolate notes continue from the first third, however there is a touch of spice introduced as well. This cigar has a very sweet aftertaste or mouth-feel. This middle third bears the brunt of the wrapper damage, so some touch-ups have been needed to get some flame to the flaying out wrapper. Overall, this continues to be an amazingly smokeable stick with almost no detectable issues – except visually obviously. Something a little new – there seems to be a little “zing” almost like a micro-scale effervescent quality on the tongue. The chocolate is starting to wane for a lighter sweeter flavor – almost like pure maple syrup, but not quite. A weird as it sounds, this is kinda like drinking a cocoa-y muscato. – it’s good, I promise. Getting into the final third, I’ve worked through most of the flawed wrapper area. This cigar is pairing beautifully with some cold-brew coffee. 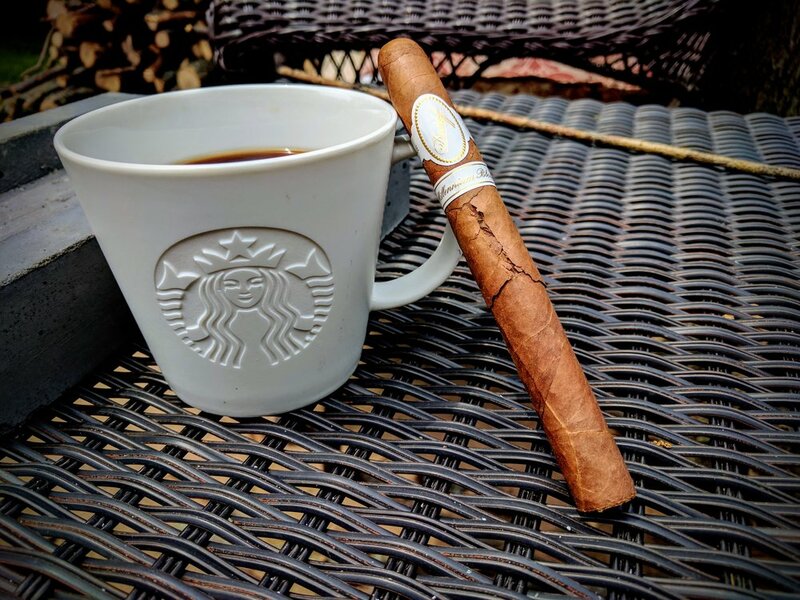 The sweetness of the stogie balances out the bitterness of the coffee perfectly. That effervescent feeling is fading a bit and the sweet, chocolatey tones have returned to the forefront. In addition, there are some toasted hazelnut notes as the cigar finishes up. 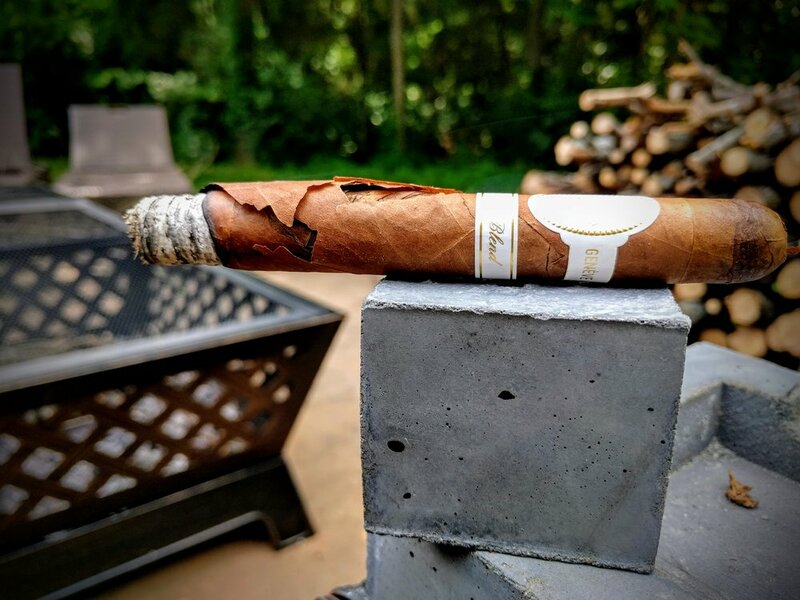 While chocolate was definitely the prevailing flavor of Davidoff's Millennium lonsdale, it took on different characteristics throughout the smoking experience to keep it from becoming monotone or boring. The complexity reminded me of when a chef prepares a dish "three-ways" to show how it can be nuanced to create a new experience. 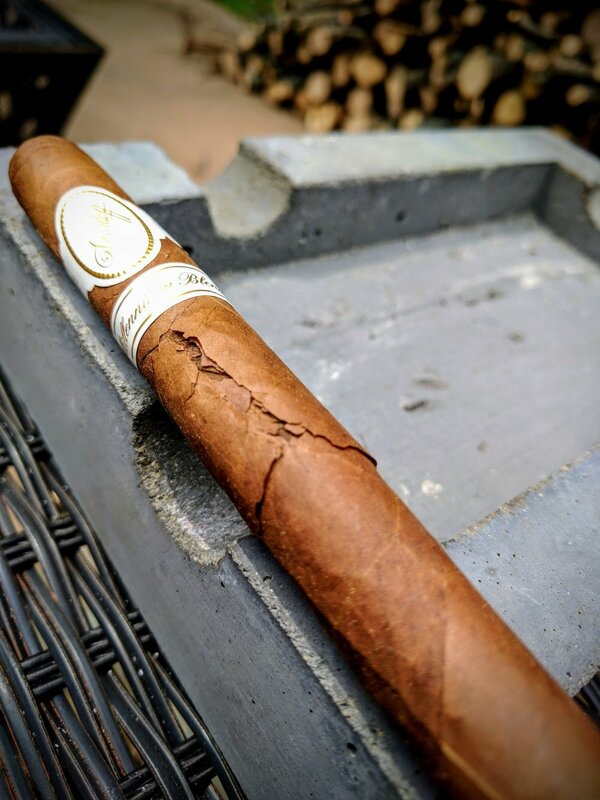 Despite some obvious wrapper and binder flaws, this cigar smoked remarkably well and consistent. It didn't require re-lights or significant touch-ups surprisingly. That, to me, is a testimony to the solid construction and craft Davidoff puts into their products. The Millenium Blend has aged impeccably. The flavors are clear and easy to distinguish – lots of sweet, cocoa-y goodness. If you don’t like the pepper/spice that a lot of cigars present, this is a perfect smoke for you – lots of flavor and smooth as hell. I haven’t had the newer Millennium blends but popped one in the herfador to try soon to compare. If you’re lucky enough to have one with some age on it, light it up – it’s smoking beautifully right now!